Dress Up the Wedding Dress! Every woman knows that one of the most costly aspects of the wedding can be the wedding dress. With the average wedding gown floating at about $1,500 (as per the Bridal Association of America), brides are looking at less embellished, simpler wedding gowns as cost effective alternatives. What if you can't afford a fancy dress with all of the pretty add-ons? Can you still have an elegant, beautiful dress that rivals the most expensive? Of course. A bit of creativity is all that is required. There are many things you can do to turn your simple dress into an elegant, gorgeous wedding gown that attracts everyone's attention. You can take the simplest of dresses, add beadwork, sequins or tulle, and make it breathtaking and original. Everyone will be talking about your beautiful dress, and they will have no idea that you didn't spend a fortune! You can choose to add decorations to the top, the bottom, or the whole dress. Altering the sleeves is also an option. If the dress you have chosen has long sleeves and you want short, have a seamstress make the alterations. Or, be daring and have one or both sides off the shoulder. Showing smooth, delicate skin can be extremely romantic. When it comes to the body of your wedding dress, there are endless options. If you know how to sew, add some beadwork or sequins under the bust line to add sparkle. Or, you may choose to leave the bodice plain and add sequins or embroidered tulle to the sleeves. A good seamstress can take care of these changes for you if you don't know how to sew. If you have a friend or relative who sews, you can save even more money. 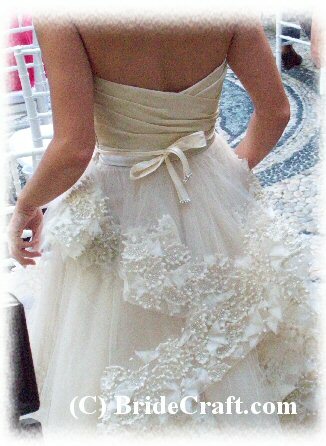 One great idea is to add embroidered tulle as an overskirt or blouse. By making the same pattern as your dress out of tulle, placing it over and attaching to the skirt or top of your wedding dress, you will have a wedding dress that has an airy feel. You may want to do this only to the top and leave the skirt plain as well. Adding small white pearl beads or crystals is another great way to dress up your wedding gown. Place pearls around the neckline of your dress, or add a few around the wrist area if your gown has long sleeves. Use your imagination! When visiting the fabric shop, look at all of the different lace and ribbon that is available. This will help you visualize what will look elegant. Another way you can take a simple dress and make it elegant is by adding ribbon around the waist line. You may want to choose a color such as champagne, and create bows or streamers to accent this area of the dress. Beautifully colored sashes are currently in vogue right now, which is an added bonus. When it comes to the most special day of your life, you want to look your most beautiful and elegant. Don't feel that because the budget is limited, you can't look just as picture perfect as brides who have an unlimited budget! By making a few inexpensive changes, your simple wedding dress will be just as elegant as any on the rack. And so uniquely you! Return Dress Up Your Wedding Dress to Wedding Article Library.